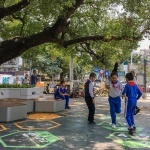 Shekou School Square is located at the intersection of Huaguo Road and Wanxia Road in Shekou. 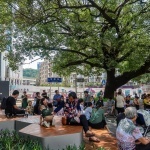 As a rare corner plaza around a high-density community, the site was always crowded with a large number of parents and randomly parked bicycles and electric bikes during peak traffic periods. 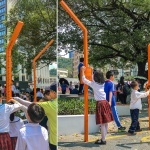 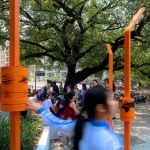 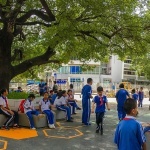 Shekou School Square was an inward-closed corner space where order was lacking when students lining-up and parents waiting in and out of school. 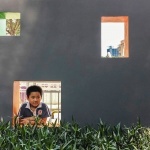 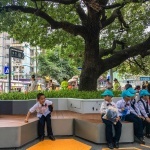 Moreover, too-much-height planters, the bulletin board with no viewer and a wall blocking human flow from Wanxia Road, all made the space function of the site very single and negative. 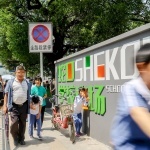 Shekou School was established in 1970, and most of the surrounding residents spent their childhood in the school. 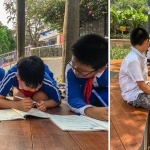 When their roles changed from children to parents, their own children also started their school time here. 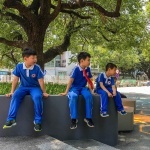 In the place where they used to play and learn, they now accompanied their children in and out of school. 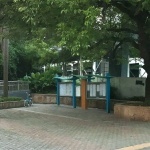 The place is filled with their childhood memories, and now they will share the same memories with their children. 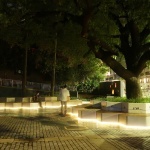 A big old camphor tree witnesses the transition of space and time in this site that is filled with memories from generation to generation. 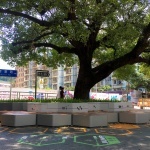 An old Chinese saying goes， “It takes ten years to grow trees but a hundred years to nurture people”. 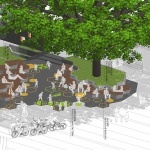 The reconstruction respects the original functions of the site, reshapes the space with “time story” theme as the main line, putting modular benches, comics of childhood games, interactive science devices, physical game patterns around the plaza so that the users are provided with a cool and shading waiting space, a free playing space and a shared space for the surrounding residents, making the plaza of memories full of vitality and fun. 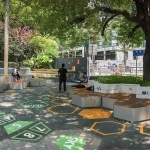 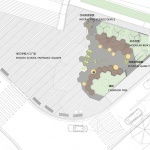 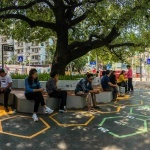 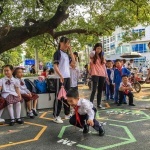 Focusing on the design concept of “Time Story”, five parts of the Plaza including: logo wall, modular benches, interactive science device, comics of childhood games and physical game patterns are placed in the space of Shekou School Square. 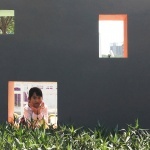 Logo Wall: through square holes in the wall, pedestrians can glimpse into the scenes of the plaza which means it inadvertently provides the site information to passers-by. 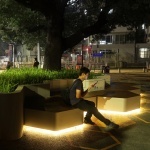 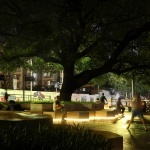 Modular Benches: the hexagonal seating are placed in combination with paving. 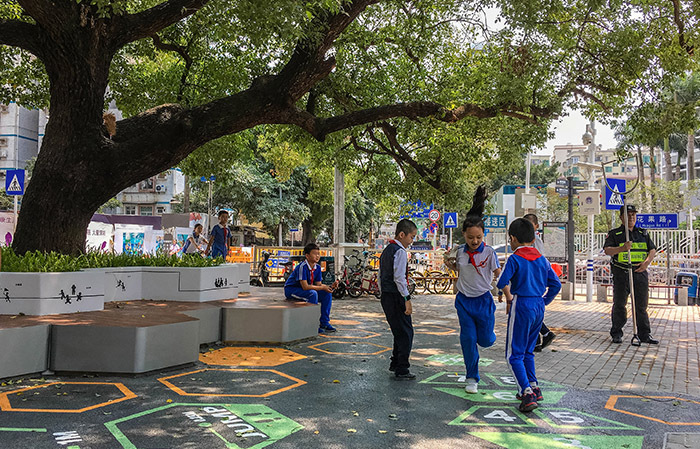 The modules are stacked in the form of blocks, providing parents and children with plenty of space to rest and sit in different directions. 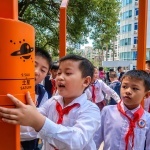 Interactive Science Device: interactive science devices made of steel columns are to convey basic metrics and geographic knowledge to users through scale units, rotating earth and galaxies, highlighting the educational culture of the school. 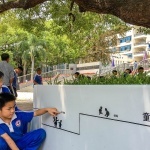 Comics of Childhood Games: silhouettes of 14 childhood games are portrayed on the flower base, stimulating the childhood memories of visitors. 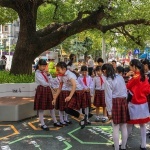 This is the childhood memory of everyone, and it also tells to school children the story of parents’ childhood games. 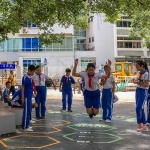 Physical Game Pattern: There is a set of hopscotch and long jump game patterns on the ground. 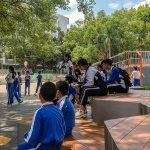 Students can play here after class, and the playing time will remain a good memory for their childhood.